My brother, Nelson Nones, has lived and worked outside the United States for years. He wrote me the other day with his “take” on the 2012 Presidential Election results. I thought his observations are interesting and thought-provoking … and offer a somewhat different perspective from what we’ve been hearing in the local media. Here’s some of what Nelson shared with me. It looks like capturing as many “WASP” votes as possible is not enough to push a Republican Presidential candidate over the top anymore. On matters of foreign trade (labeling China a “currency manipulator” on Day 1) and immigration policy (preach self-deportation and round ‘em up), the Republican Party seems to be falling into the perilous traps of protectionism and isolationism. The Democratic Party fell into similar traps years ago because of their affinity with labor unions and anti-war activists, and they could win national elections only rarely for many years as a result. Now it’s the Republicans’ turn. Hopefully, and unlike the Democrats years ago, the Republican Party will learn its lesson well enough – and early enough – to avoid the slippery slope towards irrelevance. I think the ability to attract immigrants from many races and cultures is one of America’s competitive advantages over rising powers like China, which is a palpably racist, Han-supremacist society that does not tolerate the integration of foreigners (I know; I’ve lived there). The U.S. political party that demonstrates leadership winning the economic race against China is the party that will dominate in the coming years. By rights, Hispanics and other immigrants ought to be Republicans, not Democrats. They tend to be more traditional, more religious and hold stronger “family values” than many whites these days. The majority are naturally hard-working and self-supporting, so even if they’re poorer than most people, they aren’t “47 percenters.” Another Republican majority will never emerge without them. Not only that, in time the Republicans will lose strongholds like Texas and Florida which have substantial Hispanic populations – and they will never have a prayer in states like California and New Mexico. I think the idea that Republicans should oppose immigration reform because it will welcome “millions of new Democrat voters” is incredibly short-sighted thinking. It is also fundamentally flawed because it presumes that all those new citizens will vote Democrat. From what I’ve read, Governor Romney (who lost) got 25% of the Latino vote, while President George W. Bush (who won) got 35% in both 2000 and 2004. However, if Republican lawmakers continue to obstinately oppose immigration reform, or if the Republican brand continues to be linked to harsh enforcement of existing laws (whether or not such linkage is fair), it’s a very safe bet that Republicans will never capture more than 25% of the Latino vote for a long time to come. Let’s not forget that distinct racial and ethnic groups always reward the hand that enfranchises them — often for generations. The history of Southern blacks proves this point. At first the blacks were Republicans, because Lincoln (a Republican) freed the slaves. But they were also disenfranchised by Southern whites, who were Democrats because Lincoln and Republicans had won the Civil War. When the northern Democrats put civil rights on their agenda, everyone switched sides: The Republicans successfully courted Southern whites (and now can bank on winning most of the South), while blacks overwhelmingly shifted their allegiance to the Democrats (and Romney apparently got way less than 10% of the black vote). Hispanics or Latinos constitute over 16% of America’s population now; this demographic group is about 30% larger than the black population, but in recent times is roughly five times more likely than blacks to vote Republican. Bottom line: the number of potential Republican votes cast by Hispanics and Latinos is seven times larger than the number of potential Republican votes cast by blacks. To retain a strong presence on the national political scene, the Republican Party must focus on doing what it takes to hold the Hispanic/Latino bloc of votes, and then enlarge it. Pushing an agenda that Hispanics and Latinos perceive as disenfranchisement cannot possibly work. This isn’t just about attracting votes. It’s about exploiting one of America’s biggest competitive advantages to stay ahead of China in the economic race. There is no reason why Republicans can’t, or shouldn’t, transform their brand and take leadership of the economic race. The best example I can think of to prove this point is President Richard Nixon’s rapprochement with China. Nixon, the diehard Commie fighter and leader of a political party that utterly detested China, took leadership and received credit for what is arguably one of the biggest transformational events of the 20th century. Not coincidentally, the Chinese admire Nixon and mention his legacy to me all the time. Why? Because ordinary Chinese believe he (and not his counterpart, Chou En Lai) enfranchised them by opening the door to reform in their country. I have personally delivered services on location in the following countries over the past five years: Australia, Brunei, China, Egypt, Germany, Hong Kong, India, Japan, Malaysia, the Netherlands, Philippines, Poland, Singapore, South Korea, Sweden, Thailand, the United Kingdom and the United States. English, my native tongue of course, is the common national language in just six of these countries: Australia, Hong Kong, India, Singapore, the United Kingdom and the United States. I am somewhat fluent in Thai and struggle to communicate in Bahasa, (Mandarin) Chinese and German. Arabic, Dutch, Japanese, Korean, Polish (utterly incomprehensible), Swedish and Tagalog? No way. Yet I’ve delivered my services and my clients are evidently happy, because they’ve paid their bills. How could I do this? Because they all use English, including the Chinese. (The Japanese are worst at it, by the way, but routinely employ translators, headsets and microphones to overcome the language barrier). You might counter that I deal with educated professionals and couldn’t pull this off with working-class people. Not so. Most of my clients are manufacturers, so I deal with factory workers as well as managers and professionals. Also, in the course of all my travels, I have to engage with plenty of local taxi drivers and McDonald’s clerks. Naturally not all of them know English, and when they do, their English skills are usually pretty dodgy, but nevertheless we are able to communicate well enough to get the job done. So it seems that the world has also learned to speak English. This being the case, wouldn’t most of the new people arriving in the U.S. as a result of immigration reform continue to use English, as they now do when necessary in their native countries? Having said this, even if the new arrivals abandon their current habits and insist on using their native languages, as a person with conservative political viewpoints, I would steadfastly oppose any attempt to make English mandatory. Moreover, any attempt to do so would be clearly unconstitutional, because Article I of the U.S. Constitution declares, “Congress shall make no law … abridging the freedom of speech” (the Constitution does not state “English speech”). Simply put, all Americans, whether immigrants or not, have the absolute right to use any language they wish, whether or not their choice is rational. Conservatives ought to be passionate about protecting this right, not undermining it. Of course it’s conceivable that English evolves to become America’s sole de facto language if the country does everything in its (legal) power to keep foreigners out. But protecting a single national language by targeting and blocking Latino immigration (thus preventing the spread of Spanish) isn’t conservativism in the classic liberal sense; it’s isolationism. And you can’t convince me that America would be better off pursuing an isolationist course in today’s world. Are there some countries that try to keep their languages and cultures “pure”? Sure … but usually with laughable results. France, currently mired in recession and hardly a bastion of American-style conservativism, comes to mind. “The Culture Ministry has announced a ban on the use of ‘e-mail’ in all government ministries, documents, publications or websites, the latest step to stem an incursion of English words into the French lexicon,” the AP reported. Yet all the Thais I know think this plan is a total waste of public time and money – and if you don’t believe me, just ask my wife! It’s clear to me that the 2012 Presidential Election results weren’t a one-off event, but rather the result of inexorable demographic change. Now, the Republican Party could circle the wagons and collectively moan about the erosion of cultural values, like using one language. But this way forward carries great risk: ceding permanent political power to the Left, whose agenda is certain to deal our fragile economy even more devastating blows. Alternatively, the Republican Party could take a pragmatic approach to enlarge its diverse coalition of citizens who hold common views of political freedom, limited government, the rule of law and economic freedom. I think that taking leadership on immigration reform is one way to do this. Happily, it would also strengthen our economy by leveraging one of America’s most potent competitive advantages against China, today’s rising economic superpower and the most significant threat to U.S. economic hegemony. As if on cue, I found this Wall Street Journal article on Yahoo! News today: http://finance.yahoo.com/news/heartland-draws-hispanics-help-revive-040400742.html and it reinforces my points on why America should be leveraging its appeal to new arrivals through immigration reform. The WSJ article also illustrates the challenges of fear and mistrust that need to be overcome. That’s where political leadership comes in – and if the Republican Party were to start exerting the right kind of leadership, I’d bet it could win many hearts (and future votes). What are your thoughts? Do you think my brother is on target with his observations … or would you offer a different point of view? Please share your comments — let’s get some discussion going! ← The Millennial generation: Are they redefining the concept of “news consumption”? Very interesting perspective. I agree with Nelson. It seems to me that the Republican party has isolated themselves from the “real world” and as a woman and a citizen who grew up outside the US, I don’t feel that they represent me at all. The whole movement about making English the official language, which seems to have been around for a long time, is to me a total waste of time. What’s the point? Very well written, Nelson. Thanks for the insights. Excellent article and thanks for sharing the perspective! 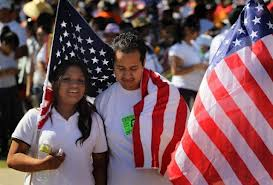 What especially resonates for me is that I feel the Hispanic population (including both legal and illegal immigrants) are largely aspiring to the American dream. Are there nefarious illegals? Sure there are, and it’s tough to argue we don’t need to do more to prevent them from entering our Country. But, en masse, Hispanics are coming to America not for free medical services or to add themselves to the victim list of long-term unemployment and food handouts. They’re coming simply because they believe in America…the idea that when you are free to work hard, your success in life is up to you. In principal, these are strong conservative values, and ultimately, the potential for Republicans to swing these votes their way is enormous. When taking the extreme and often short-term view, people chalk up all Republicans or all Democrats into their respective stereotypes (i.e., Republicans lost because they can only find an “old white man” to run. I heard this one twice the day after the election.) Or they lost because of immigration reform. While that may have been an issue the candidate (not the entire party!) stumbled over, it’s far from accurate to paint Republicans as being uniformly anti-immigrant. Similarly ridiculous is the idea that they are anti-women, or anti-minority. These are short term propaganda points that can win an election on any given day. But in the longer run, the truth usually wins out … and so I predict a large portion of the Hispanic voting block to discover that their fundamental beliefs lean conservative. In other words, their vote was the Republicans’ vote to lose … and they did on election day.